OTTAWA—Dr. Andrew Bennett, Cardus Senior Fellow and Chair of the Cabinet of Canadians, has formally announced the names of almost 40 distinguished individuals who will help affirm the central role faith has played in Canada's history and continues to play today. "The practice of religious faith in Canada motivates Canadians to great acts," Bennett said. "Faith is public and private. It defines us. It calls us to action. It is true. And it is deeply Canadian." The Cabinet of Canadians is part of Faith in Canada 150—a special effort by Cardus ahead of the 150th anniversary of Confederation in 2017. Members of the Cabinet will attend events, speak publicly, and write about the contributions of faith to public life in Canada. In doing so, they will describe how their faiths have contributed to their lives and shaped their commitments to their communities. 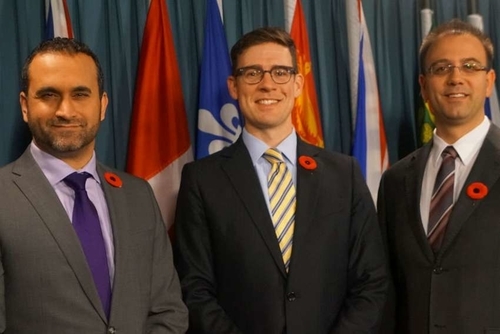 Bennett says it is especially important to celebrate public expressions of faith and thereby to champion the long tradition of religious freedom in Canada at a time when it is being greatly challenged. "There is growing discrimination against people of faith in Canada," Bennett said. "We must speak out confidently and uphold this fundamental freedom in the face of growing intolerance of religious belief in our society. Just look at Ontario where doctors could be forced to violate their consciences by referring patients for euthanasia against their deeply held religious beliefs. This is mirrored in the case of Catholic hospitals that are being pushed to set aside their prohibition on euthanasia, or law societies denying accreditation to Trinity Western University's proposed law school over dislike of the private evangelical school's community covenant." The Cabinet of Canadians aims to commemorate the historic role of faith in our country, our institutions, and our common life and to reaffirm it today.